The picture you see to the left is what one fan got from his lovely valentine during this years Valentine’s Day Holiday. 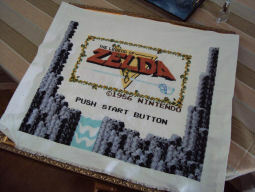 It is a cross-stitch of the title screen from the original Legend of Zelda. If you click the image you can see a much larger version of the cross-stitch, which will showcase some of the more precised stitching. Whoever made this cross-stitch really got down to every detail with each pixal on the title screen getting it’s own representation. How creative of Valentine’s Day gifts have you guys gotten in the past? Has anybody ever gotten any Zelda goodies from their loved ones? If so, post them in the comments below!